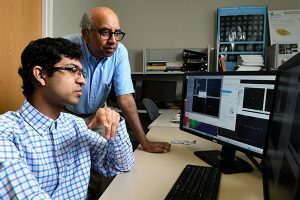 Tilak Ratnanather, associate research professor of biomedical engineering and ICM core faculty member, has partnered with the Johns Hopkins School of Medicine Summer Internship Program to provide students with hearing loss opportunities to gain advanced, hands-on experience in STEM disciplines. This year, he launched the STEM-HEAR initiative (STEM for students with Hearing loss to Engage in Auditory Research), forming a cohort of five college students: Rachit Kumar from the Georgia Institute of Technology, Yasmeen Alshabasy from Wesleyan University, Samuel Bidwell from Wesleyan University, Garrett Brown from the University of Florida, and Anne Rojona Feliciano from the University of Miami, to conduct summer research in auditory science and engineering labs across the Johns Hopkins schools of Medicine and Engineering. Ratnanather says students with hearing loss must do three things to succeed in academia: they must recognize that support is available, understand what to do with that support, and find the motivation to keep going despite obstacles. The STEM-HEAR program was designed to provide students with important tools for career development, including mentorship, networking, and research experience.